possible to draw what you see in a way that informs and delights you. In this workshop, you will use words and images to reflect your observations, and don’t worry; it’s not just about nature. We will cover tips & techniques for drawing your coffee cup, special dinner, squirrel outside the window, or upcoming vacation. 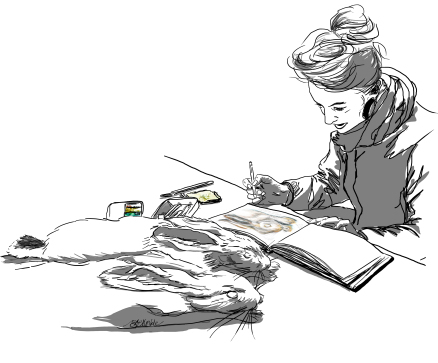 Click here for examples of the kind of sketching we’ll do. Join us to hold this ability in your hands. Pre-register in Choteau with Susan Luinstra or scroll down to register online with me. **No prior drawing experience or other artistic training is required, although more experienced naturalists and artists are also welcome. **This is a GREAT workshop for teachers interested in incorporating sketching into their classroom activities, even without possessing any drawing experience themselves. ← How to turn a home movie into high-octane "scicomm"